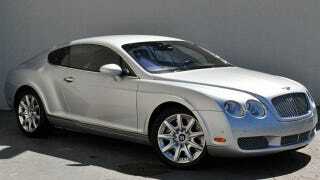 The bad thing about Bentley Continental GT coupes is that they pretty much all look the same. But the great thing about a used Conti GT, is it pretty much looks the same as a new one. This 2004 W12 can be yours for only $52k. Yay depreciation! Our man Damon Lavrinc tipped me off to this beauty at Atlanta Used Cars Marietta. It may be 10 years old, but it has less than 42k miles on the clock and a slew of features you won't find in new cars for 50k such as: a leather lined roof, adjustable air-suspension, "upscale interior" and a 552hp W12 ENGINE! So maybe spending 52k for a combination of expensive Bentley parts combined with VW reliability isn't the wisest choice. But I'm all about value propositions and when a Audi S5 coupe with a supercharged V6 and AWD starts at 52,500, a 552hp W12 monster is mighty tempting even if it is a few years old.